Everyone longs for an easy access to everything when cooking not to mention thing as simple as reaching for spices and herbs. Of course, you can always choose the easiest way and run to IKEA to buy a rack. But why should you when you can make one on your own? That’s why I have collected 10 spice storage ideas and 5 from recycled stuff that you can make on your own! 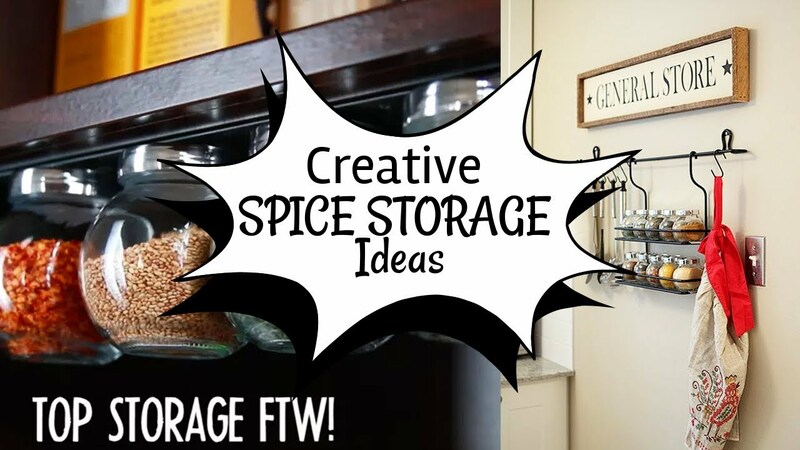 (at least after you learn this list) It won’t take a lot of time and will totally save you from spending a lot of money from buying spice storage. This one is the most efficient and quickest way to stash your spices. If you tend to buy your spices in bulk, you might want to hang them instead of putting them in a drawer or a cabinet. Re-purpose your used curtain rod as the hanger. You can hang them somewhere near your counter-tops for easier access or on the back of a pantry door to keep them cool and dry. There is no wrong way with going for a vintage look on anything, even on things as simple as spice storage. You happen to have vintage trays lying around in your kitchen or are they already in your storeroom? Take them out and make yourself nice racks for your spices. Turn them on their sides, hammer two nails into the wall and hang them with a rope. This one is totally efficient if you already run out of space for your spice jars. No, it doesn’t take up space in your drawers, cabinets or racks. This storage will be under your cabinet! With magnets glued to the lids, you can re-purpose babyfood jars to stash your spices by suspending them from a metal sheet mounted to the underside of the cabinets. Another solution for your herb and spice storage that use magnets. If you happen to stash your spices in containers, stick them on the fridge door. Not only will you get a new place to store your spices and herbs but also it will add a new appeal to your fridge. You will only need to empty your spice containers into magnetic tins and arrange them however you like on the fridge door. You no longer have to suffer from having to rummage through your drawers and cabinets looking for paprika! Of all these 5 cheap spice storage ideas from recycled stuff we have set out for you, this one is the easiest and most space-saving storage for all your herbs and spices. If you happen to buy your spices in bags you can file them in a photo box. Even if you initially store your spices in jars, you can easily take them out and put them in bags. Imagine how much space you will clear out if you put all your herbs and spices in boxes! So, which one of these 5 cheap spice storage ideas from recycled stuff we’ve laid out for you that you want to give it a go first?